Each year, I pick one word which explains what I want the next year to look, be, feel and sound like, and focuses me in on those intentions. But this year, after reading a great email from Mike Vardy on this matter, who took it from Chris Brogan, I’m picking three words that will make 2017 the best year ever for me. Before I tell you the three words, I want to thank you from the bottom of my heart, dear freedomist, for listening in to my podcast every single week. I can’t believe that this is episode 300, and I wanted to let you know that this will be the last ever podcast in this format. I’ll be relaunching and rebranding this podcast to Natalie Sisson’s Quest For Freedom this January 2017 (but you won’t have to change a thing if you’re already subscribed to it as I’m using the same feed on iTunes, Stitcher, iHeart Radio and beyond. It will be a narrative format podcast, where I will talk about topics that I want to and that you want me to, and have conversations with people on topics related to Freedom. Throughout 2016 I’ve felt like I needed a break from my business. Then after having a really poor program launch in September, I felt I had reached a tipping point, and that it was also a sign. So I started putting things in motion which will allow me to fire myself as the CEO of my business, starting April 2017. I want to take a break from the niche of online business because after almost 7 years I have been feeling a bit ‘meh’ and think it’s time to recharge and energize myself to come back stronger and better. I want to go back to being a student again. I want to be extremely curious, learn new things, focus on personal development and growth, expand my horizons and network, and dive into areas I have no freaking ideas about. I want to be excited about going to new places, meet new people, and do new things. I want to feel like a kid again, who approaches everything in life with enthusiasm. And I want adventure to be a part of my life again. Not just in terms of traveling the world which I will do less of, but being able to take a real vacation and what my life is going to feel like without the business aspect of it. This new way of life is going to be my adventure. So I want to ask you, how are you going to make it your best year yet? What are you going to change? What are you going to do differently? What are you going to give up to embrace the new in 2017? 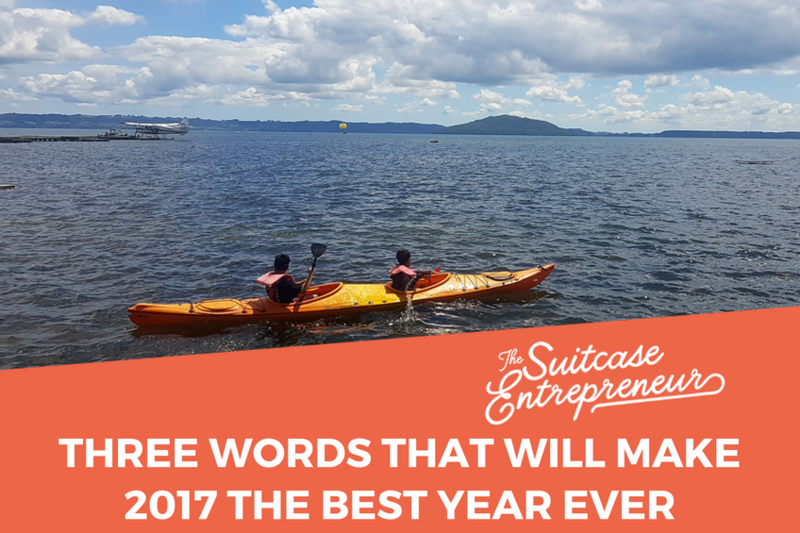 Hit me up on Twitter, Facebook, or Instagram and let me know what are your three words for 2017. Plan Your Ideal Freedom Year in 2017!